Tomato Soup Recipe – Blend, Heat & Eat! Home/Tomato Soup Recipe – Blend, Heat & Eat! 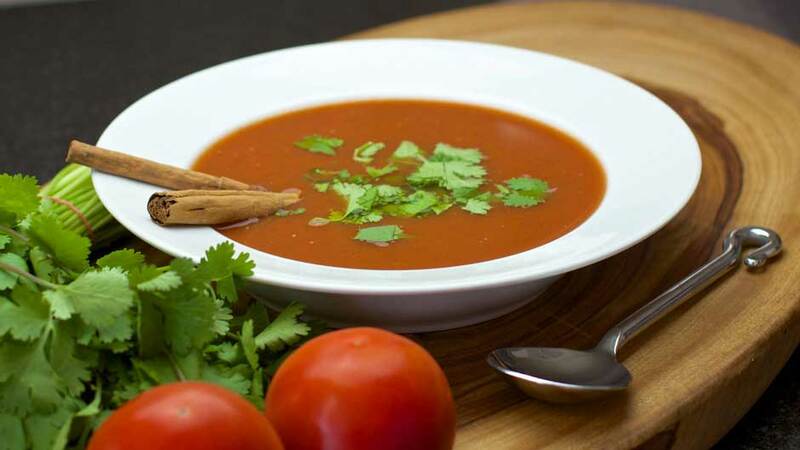 In this recipe I show you how to make easy tomato soup that tastes great! Once you have used your blender to mix all the ingredients together, you can even freeze this for heating and eating at a later date. This recipe is 100% plant based vegan! For this recipe you will need a blender, large saucepan and stirring ladle or similar. Blend everything for approximately 2 minutes or until smooth. Add mixture to saucepan and apply high heat. You may find the mixture starts out a little foamy due to the blending process, however, the mixture will settle down during the cooking process. Once the mixture is boiling, drop the heat to a low simmer and place a lid on the saucepan. After approximately 10 minutes you should have a nice rich red tomato soup. Garnish the soup with some fresh Coriander/cilantro and serve with some fresh bread and/or a fresh garden salad- Yum! !